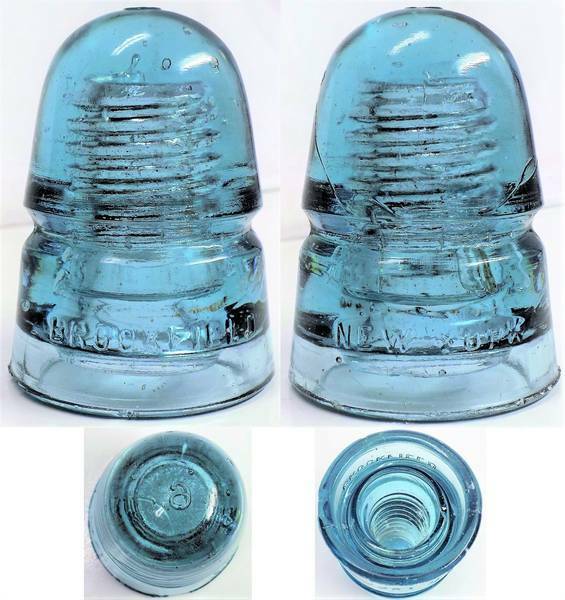 Here is a CD 145 EIN  (Dome) [Backwards] 6 (F-Skirt) BROOKFIELD (R-Skirt) NEW YORK SB in Light Blue. This one is the true "Postal" style, as opposed to what's come to be referred to as the "Darth Vader" style. As for damage, you can see the slice off the base, and there is a tiny inner skirt flake and several scattered pings and tics. A number of bubbles of various sizes and generous dome glass enhance the remarkable clarity of this looker. Asking $3 plus postage. This would be a nice one to match up with this piece [id=555212468] and save with combined postage.